Covers the traditional range of topics in regional oceanography. An important aspect of work is its novel approach to a description of the features which give each ocean region its character. The two core principles are the use of the most modern database for all maps of regional distributions of properties and a discussion of all observed features within a frame of reference developed from ocean dynamics, rather than based on the simple geographical approach. The ocean's role in climate variability and climate change is described in detail. The book also includes an evaluation of all major international research projects such as FGGE, IIOE and TOGA. The SI system is used throughout. 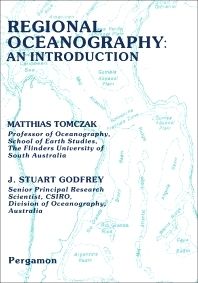 The use of modern data and inclusion of the oceanographic literature up to 1992 and early 1993 make it a useful reference text. For undergraduate and graduate students of all branches of marine sciences, including physical oceanography, marine biology, marine chemistry, marine geology and geophysics. Also of interest to meteorologists and ocean engineers. Preface. Introduction: what drives the ocean currents? Temperature, salinity, density and the oceanic pressure field. The Coriolis force, geostrophy, Rossby waves and the westward intensification. Ekman layer transports, Ekman pumping and the Sverdrup balance. Water mass formation, subduction and the oceanic heat budget. Antarctic oceanography. Arctic oceanography: the path of North Atlantic Deep Water. The Pacific Ocean. Hydrology of the Pacific Ocean. Adjacent seas of the Pacific Ocean. The Indian Ocean. Hydrology of the Indian Ocean. Adjacent seas of the Indian Ocean and the Australasian Mediterranean Sea (the Indonesian throughflow). The Atlantic Ocean. Hydrology of the Atlantic Ocean. Adjacent seas of the Atlantic Ocean. Aspects of advanced regional oceanography. The oceans and the world's mean climate. El Niño and the Southern Oscillation (ENSO). The ocean and climate change. References. Glossary. Index. 294 illus., 269 lit. refs.